The Purple Ghost Martini is a beautiful deep purple red in color that you get from the pomegranate juice and it's a delicious raspberry pomegranate flavor with a nice little twist of tart from the sweet and sour but the best part is the Ghost Peep garnish. There's nothing cuter than that white ghost peeping at you as you sip and you get to eat it at the end! For a little extra ghost effect shave a few slivers of dry ice into the cocktail just before you serve it and the ghosts will come wafting up from your martini glass. Just be careful to keep the dry ice slivers small enough they dissolve quickly, dry ice can burn if it touches the lips or skin. 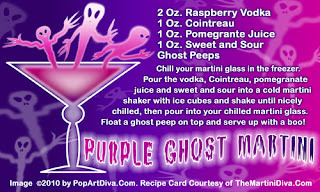 FREE, 5x3 recipe card for The Purple Ghost Martini in print quality HERE . also on FREE recipe cards!